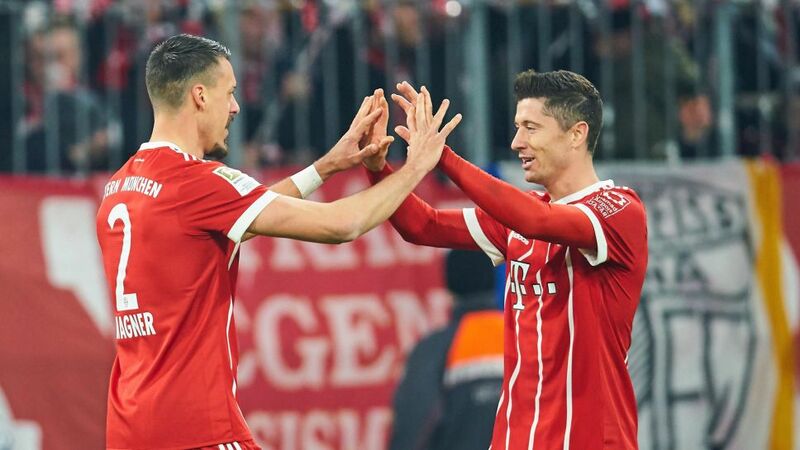 Bayern Munich's Sandro Wagner: "Robert Lewandowski is the best striker in the world"
He has seven goals in his last nine Bundesliga games for Bayern Munich, but Germany international Sandro Wagner knows there is only one king in Munich, and the rest of the world, for that matter. "For me, Robert Lewandowski is the best striker in the world," Wagner told bundesliga.com after scoring his first brace for the club in the 5-1 win over Borussia Mönchengladbach on Matchday 30. "I really appreciate [his support]. I was welcomed well by the lads and am just happy to be here. This is my hometown, my club and I’m just enjoying it right now." Wagner rejoined boyhood club Bayern from Hoffenheim in January as a designated back-up for Lewandowski, but is currently averaging a goal every 67 minutes he’s played for his hometown club in the Bundesliga. The Germany international is now on 11 for the season – still some 16 shy of top spot in the scoring charts. That position belongs to who else but Lewandowski? The Pole is streaks ahead after 30 matches, his 27 goals a whopping 13 more than his nearest challenger Kevin Volland (Bayer Leverkusen). And that despite being afforded some rest of late, with DFB Cup and UEFA Champions League semi-finals to come in the coming weeks. The Pole was on the bench against Gladbach, but replaced Wagner with 20 minutes to play. He duly brought up his 104th Bundesliga goal in a Bayern shirt, tying Claudio Pizarro as the only other player in Bundesliga history to have scored as many times for one club (Werder Bremen).